You’ve likely seen the photos: before a number of sporting events, a giant American flag is placed in the center of the field. It seems natural and merely just part of the spectacle. But to get the flag to the event and actually hoist it up takes a lot of preparation, time, and yes, cash. Those flags aren’t cheap. According to a Fox News report, they cost about $7,500. “Even watching it on TV I still get tears in eyes and a lump in my throat,” Amy Barnett, who is the chief of 50 Star Productions—a firm that rents the gigantic flags out to events. “I love the patriotic-ness of it. The crowd loves it so much, it’s amazing,” she told Fox. In an earlier Deadspin report, Barnett’s firm based in Salt Lake City is the sole one that’s “behind all those giant flags” at sporting events. “Her company has grown in each year of the decade-plus it’s been in business, providing a flag for a record 130 sporting events last year and set to top that this year, having done 120 as of last week. The vast majority of those are NFL and MLB games, but there’s a little bit of variety in there: the New York City Marathon, for instance, and World Cup qualifying matches for the U.S. national soccer team,” the Deadspin report stated. Barnett explained that the company first bought the flags for “about $40,000 each,” but now, they have an employee who sews the flags, Deadspin said. The employee sews the flags “in his basement, usually,” she explained. Barnett said the company has provided massive flags to 120 sporting events so far this year, and teams pay between $4,000 and $7,500 to show the flag—delivered in 14 separate pieces. “Each stripe is a piece and the union is a single, solid piece,” Barnett told Fox. The flags weigh about 1,200 pounds and require more than 100 volunteers to hold. 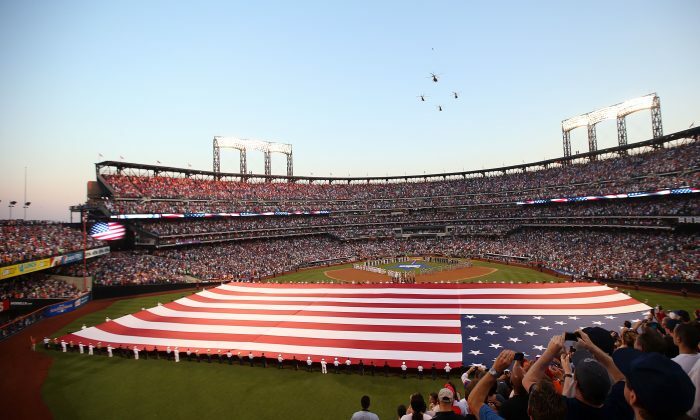 “We traditionally utilize the large flag for big games – Opening Day, 4th of July, Postseason Games, as it is a great part of the tradition of big baseball games,” Joe Jareck, who is the head of public relations for the Los Angeles Dodgers, told Fox News.